When I went to Texas after Hurricane Harvey hit, I met families who had already been through the unimaginable—fleeing their homes in waist-deep water, carrying a few precious belongings over their heads, and trying to find a safe space for their children in huge shelters not designed for the littlest evacuees. Now that the immediate danger is past, they are dealing with the uncertainty of what their homes and futures hold. In the midst of the chaos, Save the Children is helping kids cope. We set up Child Friendly Spaces in Houston, San Antonio and Dallas—bright, welcoming places for children to play with volunteers trained in helping children through trauma. We distributed supplies like cribs, strollers and wash basins to families in shelters across Texas and in Louisiana, so that parents can care for their babies and toddlers. And now we’re supporting child care centers so they can get back up-and-running—helping parents get back to work and helping children get back to learning and playing. As always when disaster strikes, the poorest communities are hit the hardest—and the effects of this storm will be felt for a long time. 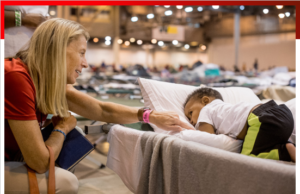 Save the Children’s Board Chair, Dr. Jill Biden, visited a mega shelter in Houston last week and met with families who have lost so much. Board Members and Artist Ambassador Jennifer Garner visited shelters and child care centers and showed families that Save the Children will be there for them in the long-term. Even with recovery underway in Texas, Save the Children turned our attention to Hurricane Irma. In Florida alone, more than 4 million children were potentially impacted during Hurricane Irma and nearly 200,000 people were in shelters across the state. As families return to their homes and rebuild, we have supplies for babies, toddlers and children ready for distribution wherever they’re needed most. The American public’s generosity to their neighbors has been wonderful to see. We were honored to be part of the Hand in Hand telethon last night to benefit the victims of Hurricanes Harvey and Irma, and I’m so grateful for the ongoing support for families and children who have seen their world turned upside-down. We know that children’s needs don’t end when the rain and flooding stops. Save the Children will be there for kids today, tomorrow and over the coming weeks and months to help them cope, rebuild and plan for the future.